When at school I had an English teacher who encouraged us to practice writing skills through a series of exercises that required us to write a piece that successfully connected two different events or ideas. I found those exercises very useful and I sometimes try the same thing when I’m stuck for something to write about on this blog. So here’s a hamfisted attempt to shoehorn two things that happened this week into one blog post. I have a standing order for a small box of vegetables every week costing about £10. The composition varies from week to week and with the time of year. The company does email and post on its website the contents of the following week’s boxes, but I generally don’t look at it. When the box arrives, it’s usually a mixture of staples (potatoes, carrots, onions, etc) plus things that are not so familiar, and often things that I’ve often never cooked before. 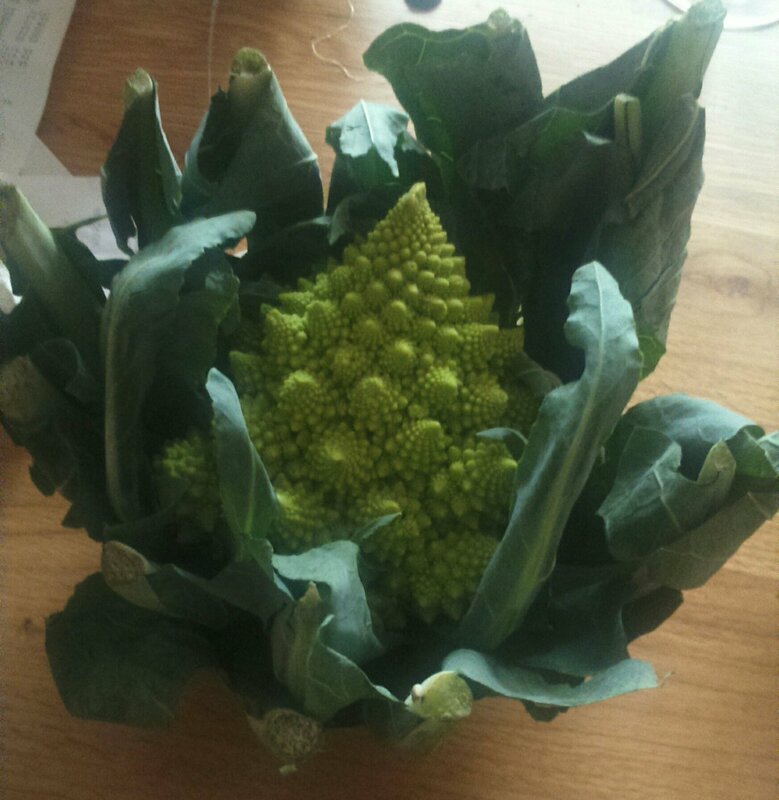 If it hadn’t been for the veggie box, I would probably never have found out about how to cook chard, romanesco, jerusalem artichokes and celeriac. I look forward to these surprises. Not knowing exactly what’s coming forces me to cook new things, and if I don’t know how to cook them there’s always google. This extraordinary fractal object is Romanesco. It’s obviously related to the cauliflower, but has a much firmer texture and has a distinctive “nutty” flavour. I am looking forward to cooking and eating this at the weekend! Another reason for resuming the veggie box service (still only £10, by the way) is that I’ve had medical advice to increase my consumption of fresh vegetables, especially those rich in Vitamin K (which includes the various Brassica that includes Romanesco, but also cabbages, broccoli, kale, spinach, chard and a host of other things that I really enjoy eating anyway. This brings me to another topic that has been on my mind this week. A chance conversation with a friend who happens to be a GP revealed that she’s seen a worrying upturn in the number of (male) university students presenting with symptoms of scurvy, an extremely unpleasant and potentially life-threatening condition caused by a deficiency of Vitamin C. University students are not famed for their healthy eating habits, and the prevalence of fast-food outlets combined with inadequate knowledge of even basic cooking techniques among young men is probably responsible for this regrettable phenomenon. The human body is not able to make its own Vitamin C so we have to make sure we eat enough food containing it. However, the recommended daily intake is actually rather small and is easily met by a modest intake of fruit and vegetables. Sailors on a diet of hard tack and salt pork had an excuse for developing scurvy, but there’s no reason at all for anyone – even students – to suffer the same fate by living on crisps and kebabs. Anyway, if you work in a university I hope you’ll consider passing this advice onto your students. Indeed if you’re at a proper university that still does small-group teaching in tutorials, why not offer your students some fresh fruit or orange juice? Just a thought. Determined to enjoy civilisation as much as I can while we still have it, last night I went to a splendid concert at the Royal Welsh College of Music and Drama in Cardiff featuring acclaimed Welsh pianist Llŷr Williams in an all-Beethoven programme. The first half of the recital consisted of the three piano sonatas (Opus 10), which are his fifth, sixth and seventh sonatas altogether. Although these are still early works by Beethoven you can already see him pushing back the restrictions of the sonata form. The first two sonatas of this set are of the standard three movement fast-slow-fast format – the first, to my mind, very reminiscent of Haydn – whereas the third has four movements and is looking ahead to what Beethoven would do in future compositions; the second movement of this third Sonata is particularly beautiful, in a darkly sombre way. None of these pieces reach the heights of his later works, but there is much to enjoy in listening to them. After the interval we had the Diabelli Variations (Opus 120). The amusing story behind this much later work was recounted by Llŷr Williams before he started to play it. In 1819 the music publisher and composer Anton Diabelli hit on an idea for a kind of publicity stunt for his publishing business. He wrote a little tune (a waltz, in fact) and sent it to a number of prominent Viennese composers (Beethoven amongst them) with the invitation to write a variation on it. The plan was to parcel all the individual variations together and sell the work as a kind of advertising brochure for Austrian culture. Beethoven wasn’t keen at first – at least in part because he thought the tune was too dull – but he then he decided to turn the project on its head by writing a complete set of variations himself. He wrote the first 19 in quick succession in 1819 and wrote another 14 a few years later. The 33 variations he produced altogether cover an astonishing musical and emotional range: sometimes witty, sometimes tragic, always fascinating. Llŷr Williams aptly described this collection as “one of the pinnacles of the piano repertoire”. Being almost an hour long it must be a demanding work to play, but he clearly relished performing it. As a Jazz fan it has often struck me how great musicians in that idiom can find inspiration in seemingly unpromising tunes, turning base metal into gold through their gifts for improvisation. Last night it struck me how similar that is to Beethoven’s use of a simple little tune as the basis for the Diabelli variations. Theme and variation, that’s what it’s all about! Llŷr Williams is currently doing a concert series exploring all of Beethoven’s piano works at the Wigmore Hall in London and these are being recorded for broadcast by BBC Radio 3. In fact, next week (on Tuesday 11th October, at 7.30) you have the chance to hear exactly the same programme that we heard last night. I’ll certainly be listening!